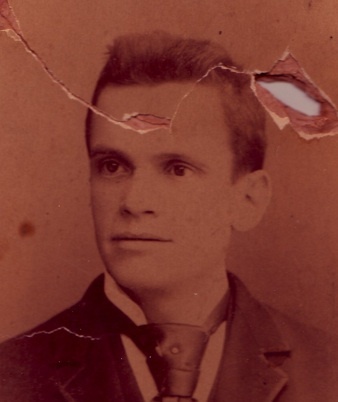 This is my great grandfather, Claudius Corke. If it weren’t for Claude, I’d be sure I’m adopted. I don’t think I look like anyone in my family except him. People say I look like my mother, but I don’t see it other than we both have brown hair and brown eyes. But I totally see my face in his. Perhaps the resemblence is less now that I’m older, although I can still see it. I scanned it in because I heard from someone who believes she might be descended from a sister of Claudius’s and she asked to see a picture. Claudius came to the United States from the Isle of Wight in England, but I don’t know when. I don’t know much of anything about Claudius except he worked as a printer at a magazine, everyone liked him, and he liked to recite poetry. He lived and died in Sheepshead Bay. (Could there be a better town name than Sheepshead Bay??) Oh, and his wife was twice the size of him. He was very thin his whole life. I think he looks like someone who would have gotten beaten up a lot on the playground when he was a kid. Maybe that’s he why he honed the likability skill, as a means of self-preservation. Thanks for sending and posting the picture. I have gone through my dad’s (Claude’s) pictures and have selected 4 to scan and send to you. The only one where he is in his 20s is not a closeup but you can still see his face. The others are when he is in his 30s and you will be able to see the resemblance to Claudius. Claude was quite thin his whole life, too. I love the story about Claudius’s wife being twice his size. I love to imagine who these people were. They seem to somehow stay with us, don’t they? Especially when remembered. Thanks! PS I hope that storm did not flood your building! Hey Cathy, I think I forgot to thank you for sending me the picture of your dad. I keep forgetting to call my second cousin about this. I know she will know if there’s a connection. She even went to Ireland to do further research.